Win a Surprise Squishy Box! It would appear that Squishies have become rather popular! I'm seeing them everywhere and even being advertised on TV, so is it any wonder that the wonderful owners of Blippo have created a website dedicated to Squishies? I have been fortunate enough to be given a sample of the squishies that you can purchase from SquishyKiosk.com and by far my favourite is the big pink Bear! [I'm thinking Blippo know me too well.....]. My son loves the yellow poop and has the ice cream is hanging on his noticeboard. I love how you can squash them up in your hand and they just bounce back! I may express this a wee bit too much in my video below! 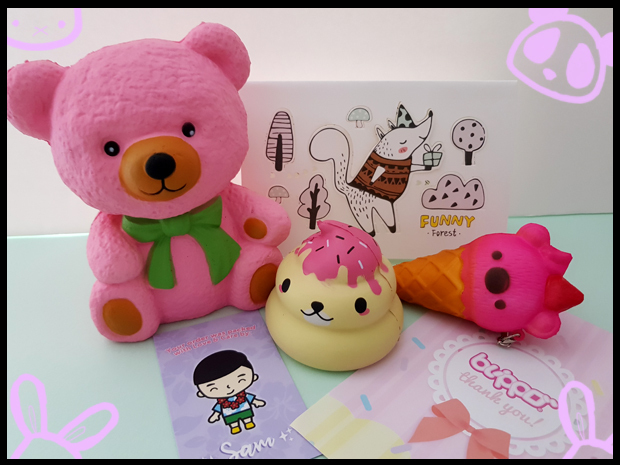 For me, I think these squishies are of great quality, a good size and with the pink bear selling for £6.34, a rather reasonable price in my opinion. You could be the proud owner of a Squishy Kiosk surprise box! All you need to do is complete as many options as you like from the Gleam widget below and Blippo will pick a winner on the 25th April. If you're not fortunate enough to win the box, then do have a roam around the site anyway, you never know there may be a unicorn, ninja, chocolate or poop that takes your eye and best of all it's free shipping to the UK.